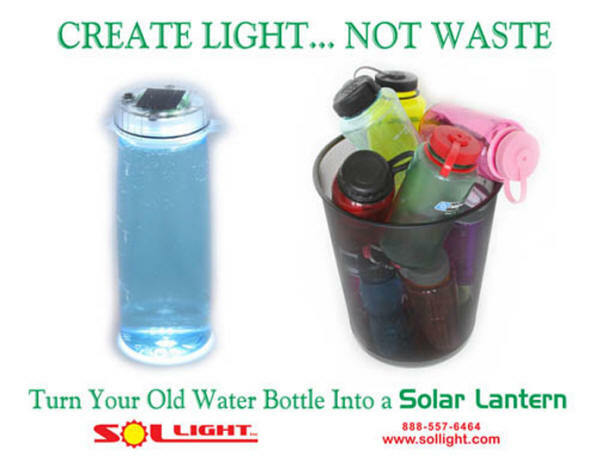 "DON'T THROW AWAY YOUR OLD POLYCARBONATE WATER BOTTLE - TURN IT INTO A SOLAR LANTERN! The last thing this planet needs is any more plastic in the landfills. But what do you do with your old polycarbonate water bottle (Nalgene or similar) that you don't want to use any more? Don't throw it away! With the incredibly handy LightCap200 you can turn your old (or new) bottle into the coolest home, deck, boat or camping lantern anywhere! Just pull off the old cap and replace it with a safe, bright, environmentally-friendly solar-powered LED LightCap200 and you'll have light anywhere you want without wasteful batteries, dangerous, toxic fuel, or electric cords. Put one on your picnic table, deck, out by the BBQ, kids playhouse, bedroom nightlight, car safety light, cockpit light on your boat, camper, tent or anywhere else. Simply fill your bottle with water (even colored water) for a safe lantern that won't run out of fuel or be a fire hazard. No candles to burn out, and when your bottle is filled with water it won't tip over if the wind comes up. The built-in light sensor automatically turns the light on whenever it gets dark, and off when there's enough light for charging. Or you can click the water-tight switch and turn it off manually. It weights only 2.6oz and you can even use it as a flashlight. The four super-bright, white LEDs provide lots of light without giving off any heat or danger of chemicals in your water. By adding a LightCap200 cap to your bottle you're not only creating a useful item, you're helping the environment. You can even use your bottle to store things: trail snacks, dog treats, fire starting supplies, first aid kit-anything you want to keep safe, floating and dry. With the LightCap200 on top, you've always got a useful emergency light. For six or seven years I have suggested that folks use the plastic water bags offered first by Platypus and soon by Nalgene. Our reason was that the indestructible Nalgene polycarbonate bottles weigh about 6 ounces each. The Platypus one liter bags weigh about one ounce each. No big deal, you say? How about a climb of one of our Three Sisters wilderness peaks in the summer. You will need at least three quarts for the 5,000 foot elevation gain for most of these peaks. That amounts to over a pound of empty polycarbonate bottles for the trip back. The bags weigh about three ounces! A second problem is the bulk of the hard plastic bottles. The bags can be rolled up. The polly bottles can break your ribs if you fall on them in your pack. I like to mitigate Risk, not eliminate it. I will continue to use my Nalgene bottles for the big gulp when I leave the car and when I return to the car. But I will put in FRESH water each time I go out, not drink the stale water from last week.